I've noticed the kitchen at work has a plague. A plague of sachets! Every time I see one of those 'Oatso Simple' sachets I cringe. Let me explain. 10 sachets of 36 costs a princely £2.45, which means the oats cost 25p every morning. Milk at work is free. - You know exactly what's in it! There are three of us in our household, which means we're saving £219 per year by just using value oats. That's just under 2 days work a year I'd be doing to exchange the spooning of oats into a bowl for the tearing and pouring of a sachet. That amount, invested yearly into a low cost index fund, should amount to over £10k in 20 years. Madness, I tell you. 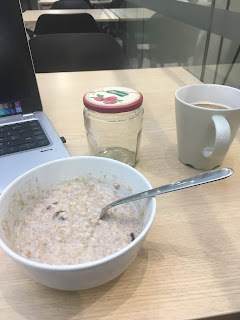 To keep me on the straight and narrow (literally as well as figurately, oats are great for you) every Sunday I weigh out 5 portions of oats and put them into recycled jars for me to grab as I head out of the door before work. I like to mix it up: sprinkle on cinnamon, or some raisins, or set out 5 bananas to chop on top. What small things have you optimised?